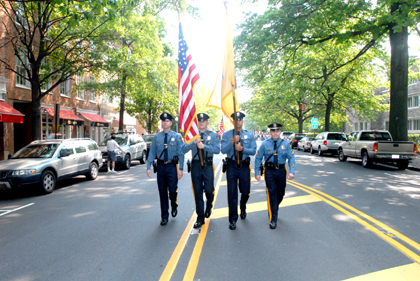 HITTING THEIR STRIDE: Members of the Princeton Borough Police Department were among hundreds of individuals taking part in Saturday's Princeton Memorial Day Parade, where more than 1,000 spectators were on hand for the hour-long Nassau Street event that extended from Princeton Avenue to Borough Hall. The parade was the ninth Memorial Day parade organized by the Spirit of Princeton, a charitable, non-partisan, community organization. "We've definitely hit our stride," said Mark Freda, Spirit of Princeton vice chair. "Everyone's really happy to be part of this, and we're all proud of what this event is able to achieve." Mercer County Executive Brian Hughes agreed: "This is something that brings our community together in a special way and it really shows everyone's spirit." Despite Princeton University claims that relocating New Jersey Transit's Princeton "Dinky" station 460 feet south would ease traffic flow through a proposed arts neighborhood around the intersection of University Place and Alexander Street, several members of the Regional Planning Board of Princeton this week have expressed concern with the proposal, while conceding that the plan was too provisional to merit an outright public challenge. but not, apparently if they have to pay for parking. The removal of a municipal subsidy that, prior to February 1 this year, allowed patrons of the Princeton Public Library to use the Borough-owned Spring Street parking garage for up to two hours for free, was the topic of a report presented by Library Director Leslie Burger to members of the library's Board of Trustees last Tuesday, May 22. As the Memorial Day Parade passed down Nassau Street on Saturday, members of the area's teen community focused on peace and ways of working toward it through an understanding of current events, with tips from activists on how to get involved and why. Princeton Township in the last year achieved its goal of becoming 25 percent preserved  an assured triumph for conservationists and outdoors people throughout the region. But a recent grant given to the Friends of Princeton Open Space has all but guaranteed that those preserved lands are now better linked and more accessible for those curious to see where their open space taxes go. Borough Hall last Tuesday favored an increase in the municipal surplus over further cuts to the tax levy, as Council, by a 5 to 1 margin, voted to approve its $24.19 million budget. Planning Group Delivers a Rare Look at the "Athens of Mercer County"
Looking out from the second floor of 179 Nassau Street at 182 Nassau Street, home of Carousel Restaurant on the first floor, two floors of office space, and a penthouse level of residences, you can see through the stucco facing to the good planning. Jeff Terrell didn't look like a potential starting Ivy League quarterback, let alone an NFL prospect, based on how he performed in his first scrimmage with the Princeton University football team. For Caitlin Corr, serving as the captain of the Princeton University women's lightweight crew is hardly an all-work and no-play proposition. In her sophomore year at the Hun School, Tarah Kirnan traveled down to Loyola College in Baltimore to check out the 2002 NCAA women's lacrosse Final Four. Sometimes it takes time and a little luck for the right person to find the right niche. Pamela Elmi believes she's found hers as the new full-time executive director of Princeton Young Achievers. "I hope to be with PYA for a long time," she said. High quality custom framing and a selection of paintings by area artists is available at Queenstown Gallery in Pennington. Housed in the Isaac Hart House (1798), the gallery (which derives its name from the original designation of Pennington) is located at 43 South Main Street. It is now owned by Marc Udell, custom framer and professional photographer. "I wanted to open a frame shop for years," says Mr. Udell, who has a degree in commercial photography, and was trained in custom framing by Larson Juhl, the leading manufacturer and distributor of custom picture framing moldings. Olives is a true Princeton success story. Opened 12 years ago, offering Greek and Mediterranean food, this gourmet bakery and delicatessen's popularity just grows and grows. The newly expanded space enables Olives to offer more delicious dishes, including top-quality prepared food to go. Now, even more hungry customers line up waiting to pick up their favorite dish.